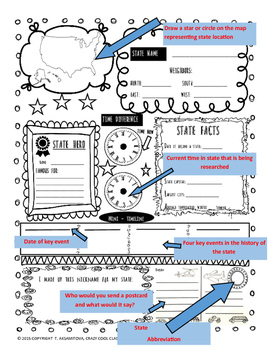 Fun interactive state research "poster" (8.5 x 11 - REGULAR PAGE SIZE) for students to strengthen their research skills and further deepen their USA STATE knowledge. This poster is designed in a way to accommodate any chosen state to research. 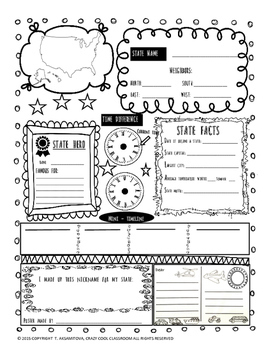 It is in black and white for students to color and fill in / draw. 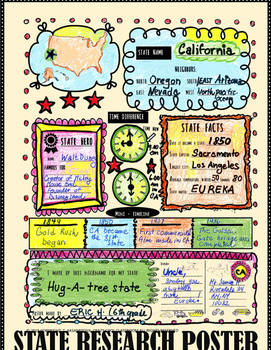 STATE TIME DIFFERENCE - students draw the time at home and time in the state they are researching if it is not their home state. "I MADE THIS NICKNAME FOR MY STATE" - students make up a nickname for a state. 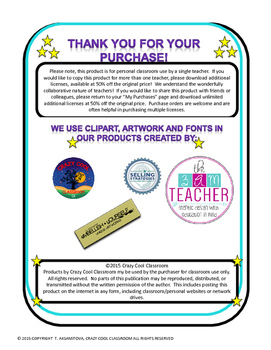 MINI POSTCARD TO SOMEONE OF MY CHOICE - "what would my postcard say"
STATE ABBREVIATION - located on their mini postcard where their stamp would go.